Simplicity 4 Column Blogger Template, have 4 column at mainpage and become 3 column when you click the post. Simple, have no many image, do not worry about heavy loading. From Minima Template, default blogger template and converted to 4 column by Kang Jaloee. I just make a lil bit customization ;) , thanks for not removing credit footer. 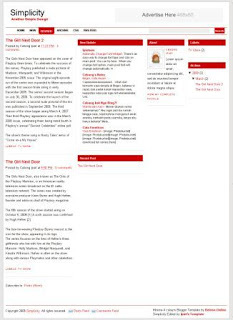 This template is suitable for news blog, you can put feed, blog list, on sidebar, just like news portal. best blogger template ever made!!!!!!!! truly news blog!! I've seen and tested over hundreds of templates but this one I must say is truly the No 1. Thanks to you. @alert:i've fixed it...what's your email..i'll send you new xml..
Hi Cebong, You are right. The Search button is coming down in IE. It works fine with Firefox. Hi Cebong, I got your prompt help,i mean the new template on my mail. Thanks to you, it's now looking good in IE also. I'll be using it shortly... I have one more question regarding the post area. Can we have a fixed length and width post box area like the ones http://nahai.blogspot.com . If yes, can you please guideor mail me on how to go about. Hi Cebong, Thanks for the mail and the help. I followed the steps as you have instructed in the link above. But I'm getting different results. 1. The picture stretches beyond the width size i gave. 2. The script sometimes works showing the height determined and sometimes it still shows the full post. 3. Is there any way on how to put HOME (in the menu bar) right on the left corner. I mean inline with the logo. The empty space doesn't look good. 3. edit margin and padding of menu..
Hi Cebong,I have found a way to do it. It's from Kang Rohman. But,like you i'm bit busy now so will work on it later to make this template truly news magazine. cara ngubah tampilanya gimana mbak? soalnya pak soewoeng ngak mau ngubahkan tampilan blogku.... terus disuruh tanya sapimoto... sedang saya ngak kenal sapi moto bu... bisa membantu? Not exactly new...but i've raised it from the graveyard again :) Can you notice something is worng with the automatic post height and below the comment box...there is too much space between the posts. Any solutions for this? Hi Cebong,tried but failed again. I'm struggling...Can u pls check it on IE it even says You are not allowed to view this ... ANd in Firefox the space between the posts remains same. I like this template...but... :) unless u give a final touch like auto post box and solve the space ... might have to lokk for something again. Now the Navigation problem has been solved and nolonger does it look out of place...That's good news. I'm looking 4ward to ur relpy. @alert: divide header become two section, header right and left, try copy from another template.. Format post tidak aktif, seperti ul sama ol atau blod. Gimana cara mengaktifkannya?